Free SMS Software Application Try ! Being addicted to texting , people always worry about the astronomically high bill which burns a hole in their pocket. Fed up of ever changing Sms schemes one wonders if there is some Free SMS service on mobile that just lets one message with no worries and tensions. Check out this awesome mobile application for free messaging called 'Zozoc'. Zozoc is a simple mobile application which was first launched in China in 2006 and boasts of 16 lakh users. It uses the internet connection on the phone to send and receive messages. Something similar to how we can send free sms from a website using a pc. But its way more cooler than that with amazing features. Click here to downlaod Free SMS Zozoc App. First of all its a free mobile application that means its free to download and gives the independence of free messaging from anywhere,anytime. Secondly it has unlimited characters which enables a user to write to his heart's content. There are absolutely no ads inserted in the messages unlike other free sms services. Another feature is its ease of use. Its so simple and user friendly that even an amateur at using mobiles can benefit from its usage. Its got a very neat interface and has the same look and feel of the default inbox. A perk that Zozoc provides is they don't differentiate between a local sms or national sms. Even group messaging is treated like one sms so irrespective of sending a message to one person or many, national or local, all will be at the same rate which is minimal data charges that your operator will charge you for using GPRS. What is the most alluring, eye-catching characteristic is that in India, on special days and holidays, not a single penny is charged for those special SMS's. SMS's from Zozoc are free and unlimited on these days too. Zozoc is available in both Java and Symbian version making it more compatible with all the phones. Zozoc supports more than 300 + mobile phones and can be used in 140 countries. 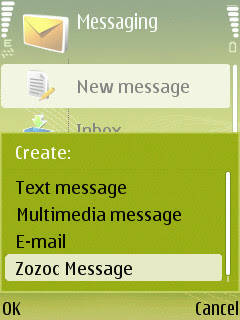 The Symbian version integrates itself in the default inbox which is a very impressive feature. The user just needs to go to the inbox and instead of text message select Zozoc message. Thats it. There is no need to login or logout. The application keeps you connected all the time . Zozoc also boasts of a 1500 plus ever-growing Ning community as Zozoc Community. It has a good support and queries are addressed on time. Zozoc supports both PC-Zozoc and non PC-Zozoc. Overall the service is reliable and instant. Zozoc also provides free message delivery report and you can even add a nickname instead of your name while sending messages.